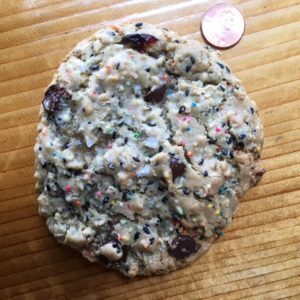 Carpe Cookie | A grade-A cookie lover's account of the best - and sometimes worst - cookies around. I’m pretty sure there is no bakery that sees my face more often than Seastar. 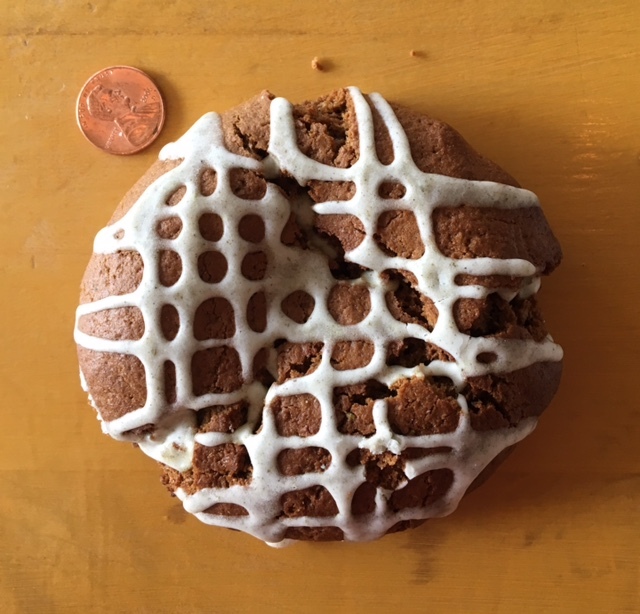 But here’s the crazy thing: I don’t typically end up with a cookie or pastry when I’m there. Totally unintuitive, I know. This is not because the cookies and cakes and muffins aren’t good (they are!) but after filling myself with thick amazing corn durham toast (all of their breads and baked goods are made with flours that they mill themselves from several different types of whole grains sourced by local growers – a labor definitely worth their efforts, imo! 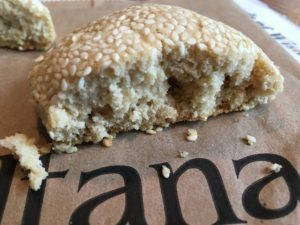 ), plus an egg – and also seasonal vegetables – both of them cooked in their beautiful wood fire oven, and also a side of tahini…and honey and butter – and 3 cups of coffee, I’m too stuffed for cookies and cakes and muffins. 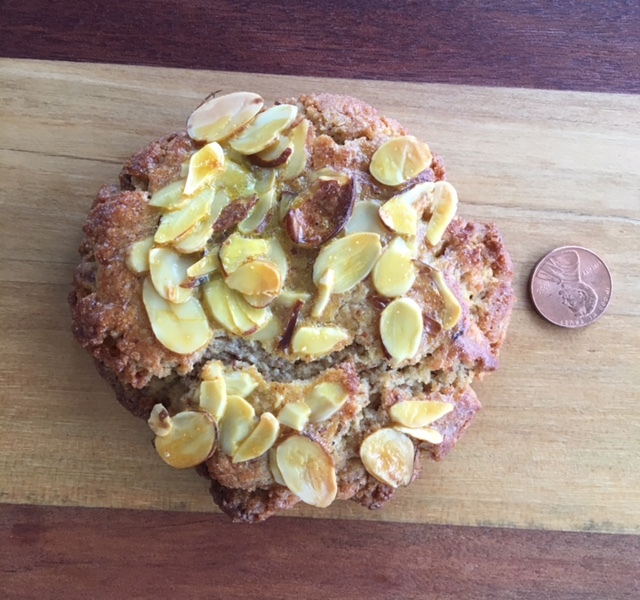 Last weekend, however, I stopped in for breakfast with my brother on our way out of town heading up to Seattle and bought one of these butterscotch numbers that I’d actually been peeping for the past few weeks – a relatively new addition to their lineup. (He is possibly as cookie-curious as I am, something I think I’ve mentioned before). We tossed it in the backseat of his car for a future snack during our 3 hour drive. Which we did – somewhere around Centralia, WA. And here is the upshot: this is the first public cookie I’ve eaten in months that moved me enough to write about. Which justifies my lack of a single new post in nearly 10 months, but is also the absolute truth. 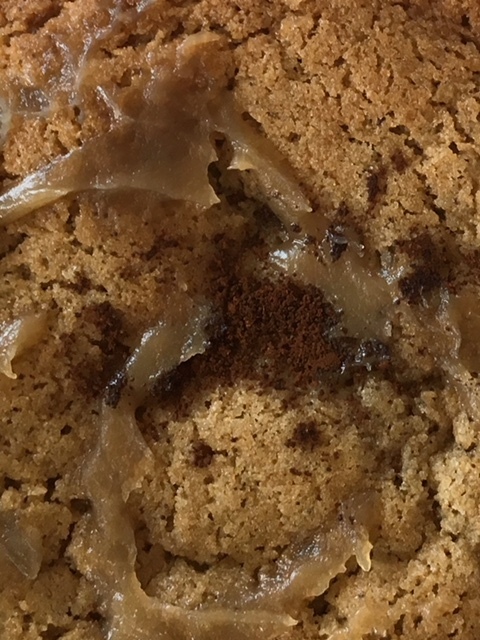 • The butterscotch flavor (aka brown sugar and butter, aka one of the very best combination of ingredients ever invented in the history of the world) is present and accounted for. Assertive, in a good way. Who has time for an unassertive cookie? • Firm and slightly crispy along the circumference – soft and perfectly underbaked in the center. • Butterscotchness enhanced by a thin drizzle of butterscotch sauce atop. 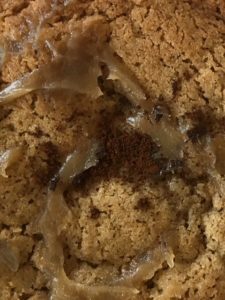 • Additional and unexpected embellishment: a sprinkling of finely ground coffee (or espresso?). Nice move, guys. This really pulled it all together quite nicely. I wouldn’t have thought of it on my own but I’m for sure stealing that idea. The fact that there are a mere 3-4 other peanut butter cookies on Carpe Cookie is not an accident. As I mentioned in at least one of those reviews, I find it hard to get excited about a PBC. They’re typically bland and flat-tasting, not salty enough (for the love of George Washington Carver, peanuts need salt!) and often greasy. Just not my thing. I didn’t go to this place looking for a cookie. 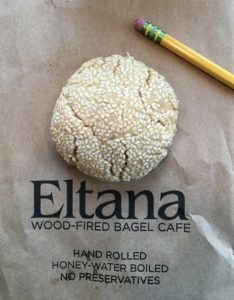 I mean it’s a bagel joint – a step above the typical bagel bakery offerings with things like fava bean spread and shakshuka on the menu (check it out) – but still, not a place I was expecting to find a remarkable cookie. And then I remembered that, historically, some of my favorite cookies ever were found when I wasn’t looking for them, like at grocery store bakeries and taquerias and throwback 1990’s coffee shops. I’ve been on sort of a tahini/sesame jag recently (fyi: a little swirl is so nice on vanilla ice cream with a drizzle of honey and salt), so I didn’t think twice when I told my bro to grab this tahini cookie when we were ordering our bagel lunch – the only cookie (or any kind of dessert, I think) in the entire place. Conclusion: It was not a mistake! 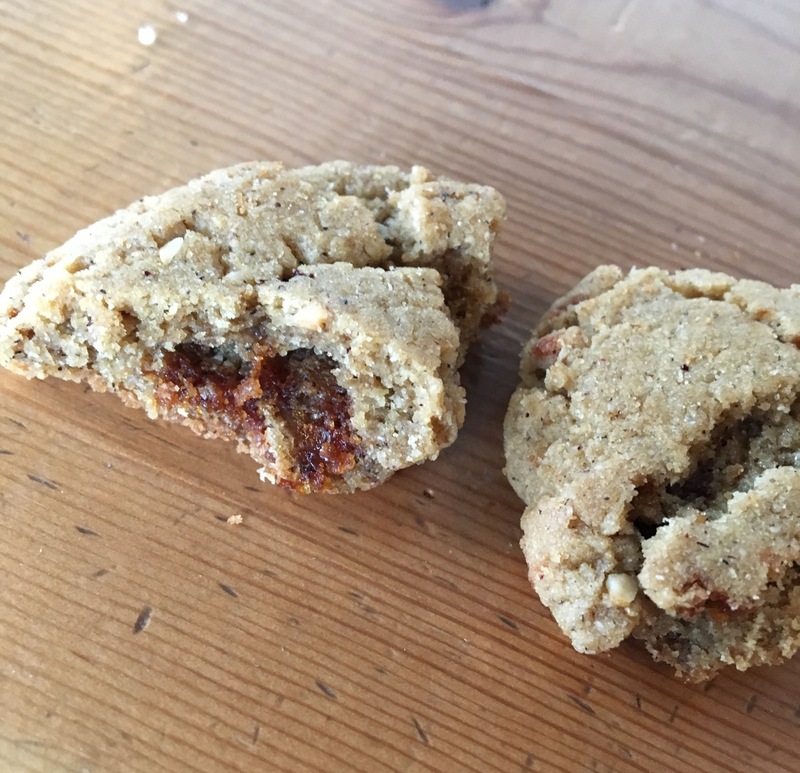 Okay, so imagine the sort of peanut butter cookie that is made mostly of peanut butter, held together with a little flour and sugar and (maybe?) eggs. And salt. (Salt is a must, especially in a nut/seed heavy cookie. I cannot say this too many times. This one could have used more, imo.) It’s that same sort of dense, protein-y texture as that cookie, but sesame-y instead of peanut-y (obvs). With even more sesame seeds sprinkled atop, as your eyes can see. You could eat this cookie in place of a protein bar and not feel like you were lying to yourself. No joke. Points to Eltana for their out of the ordinary offering. This is really more like a tiny cake – or a “cake-let” – than it is a cookie, if you want my opinion. (And if you’re reading this, you clearly do want my opinion.) No, I cannot back up that declaration academically. 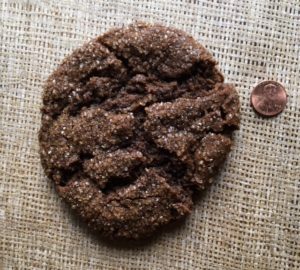 All I can tell you is that when I think of a molasses cookie, this is what comes into my head. Or this. Or anythingI’ve written about under the “ginger molasses” pull-category over to the right. My 2-3x/year trips to Eugene are nearly always capped with a stop by Sweet Life on my way out of town. By “nearly always” I mean always. What is happening to my mouth? I suddenly crave snickerdoodles regularly. For the first time in all my cookie-eating years. 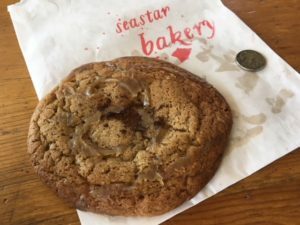 Here’s something sad: I recently realized I had not been moved to write about any new cookies I’d met for over TWO months. Not since that almond-y beut in Oakland. Here’s something not sad: Then one day this ace of a chocolate chip number showed up in my life. I keep forgetting to tell you about the last great cookie I ate! That being said, while not necessarily an earth-shattering ginger molasses, it is certainly a solid option – not shy on spice and flavor and overall pretty satisfying. Note: I thought it tasted even better two days later than it did freshy-baked. Only a well-made, not over baked cookie will pass this integrity/longevity test. There are two Grand Central Cookies that I’ve loved for ages: Triple Chocolate and Oatmeal Raisin. I return to them again and again. And again. These are staples in my Portland cookie circuit; they are consistent, solid, always pleasing.